This will be a festive year at the Grandfather Golf and Country Club, which will host a variety of events in a season-long celebration of its 50th anniversary. “It will be a time for us to honor the past as we celebrate the future,” said event chairman Bob Eoff. In addition to several tournaments and gala parties, the private club in June will host a group of members from the Nairn Golf Club in Scotland to help commemorate the club’s Scottish heritage. A family named MacRae, from the Nairn area, immigrated to Wilmington, N.C., and later to Linville, developing much of the land in the Grandfather Mountain/Linville locale. The popular Grandfather golf course, rated as the second best in the state by the North Carolina Golf Panel, can trace its origin to a whim by the late Agnes (Aggie) Morton in the early 1960s. Ten years earlier, she had inherited nearly 2,000 acres of scenic terrain in the Linville River Valley at the western base of Grandfather Mountain from her grandfather Hugh MacRae’s estate. Over the years she often rode horses and hiked the property, always marveling at its rare beauty. One of the state’s best amateurs, she dominated the Carolinas Golf Championship, winning it four times in a span of a decade from 1948-58. In 1948, she made it to the quarterfinals of the Women’s United States Amateur. 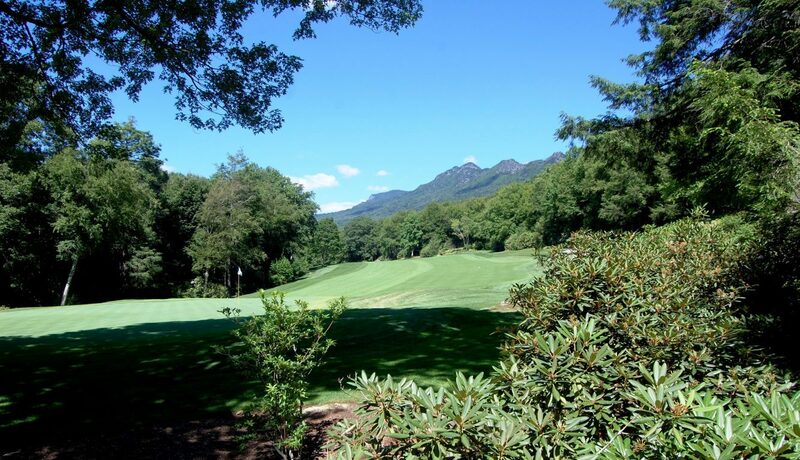 When Aggie was in the mountains she played mostly at the Linville Golf Club, but starting times were becoming harder to get and she became frustrated with the hassle. Impressed by the work of Ellis Maples and his affiliation with the great Donald Ross, Aggie hired him to design the course. The two worked together closely, and spent a lot of time romping through rhododendron thickets, forested areas and over creeks for weeks before finally came up with a routing that each thought was ideal. Noted architect Ed Seay, who later teamed up with golfing great Arnold Palmer as his top course designer, played a key role in the construction. He was a Maples assistant at the time. Course construction began in 1965 and was completed three years later. Work was slow because of the large number of boulders and trees that had to be removed and ground that had to be leveled. If those obstacles weren’t headache enough, Aggie soon found out that construction cost twice what she had budgeted and financing became a problem. For financial help, she turned to her brother, Hugh Morton, and his childhood friend, John Williams, a frequent mountain visitor who was from Tulsa. Okla. The twosome furnished the necessary capital and, along with Aggie, are known as the founders of the Grandfather Golf and Country Club. They are honored each June with a Founders golf tournament and banquet. At the outset, Aggie had named the course Glen Dornie Country Club after an area in Scotland where the MacRaes had a summer home, but Morton and Williams persuaded her to change the name to Grandfather. The finished product was worth waiting for and now, a half century later, the course has taken its place among the best in the nation and is highly ranked by both Golf Digest and Golf magazines. In-state, the course is referred to as the “Crown Jewel of the Mountains” by golf enthusiasts. The Grandfather course is noted for many things, including unique beauty, excellent conditioning, a variety of challenges, fairness, a good walk and the fact that no other holes can be seen from the one being played. Signature holes are the par-4 8 and finishing 18th, with its peninsula green guarded by water on three sides. The towering peaks of the famed mountain for which the course is named can be seen from a number of holes. Over the years, a number many national celebrities have played the course, including evangelists Billy Graham and Oral Roberts, comedians Bob Hope and Jerry Lewis, basketball coaches Dean Smith and Roy Williams, baseball stars Ted Williams and Mickey Mantle, Army Gen. William Westmoreland, Augusta legend Cliff Roberts, and such famed golfers as Sam Snead and amateur Billy Joe Patton. The course measures 7,021 yards from the championship tees and has a course rating of 74.2 and a slope of 148. Bob Kletcke, the club’s first head professional and an active member now, holds the course record from the championship tees with a 62. Grandfather also has a scenic and challenging par-3 course which receives steady play throughout the season. Over the last few years, Bobby Weed Golf Design began renovating the private member-owned club in Linville. The work is part of a 10-year master plan by the Florida-based design company. Bobby Weed Golf Design helped the club restructure a short-term and long-range plan to preserve and enhance the classic Maples layout. Following some substantial improvements several years ago, Weed and his team have worked in a creative and incremental fashion, each autumn and early spring, so as not to disrupt play. Extensive tree removal, installation of subsurface fairway drainage and construction of open rock-lined streams are some components of the renovation. Over 40 years tree growth in the corridors necessitated removal efforts to bring many of the holes back to their original lines. The green and tee complexes, and then the fairways, were the beneficiaries of the widespread tree removal, which nonetheless is nearly undetectable to players accustomed to the lush beauty of the course.